where the VORTEX won the gold medal for best smoking product. It gives the effect of a gravity hit while at the same time smooth like a vaporizer. A how-to video for using the Gravity VORTEX. Jack Herer, legendary marijuana activist takes a large hit off the VORTEX. Pot Head Society guys show how to hit the "upsidedown VORTEX"
This is what happens when a hot girl gets a hold of a VORTEX. Check out how smoke fills the top chamber with a thick cloud of smoke. Promotional clip for the Gravity VORTEX, the first portable gravity smoking device. Check out more videos of the Gravity VORTEX. There are many more on You Tube, check them out by clicking here. 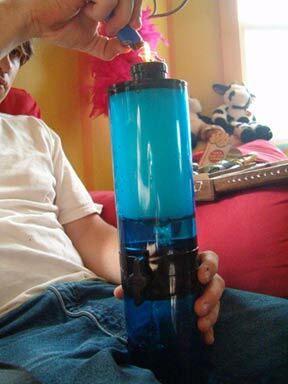 The GravityVortex is strictly for tobacco use only. Copyright © 2005 Nine Point Eight Entertainment, LLC. GravityVortex and the GravityVortex logo are trademarks of Nine Point Eight Entertainment, LLC.